Spyglass, an iPhone/iPad application is a great tool to have in your photography arsenal. In the field it is difficult to for a new photographer to know where to point their camera to get a star circle, and also get an idea what the composition may look like. Now there is an app for that: Spyglass. Spyglass typically is used for aviation or navigators but adapts well to night photography where it is well suited for scouting and shot pre-planning. 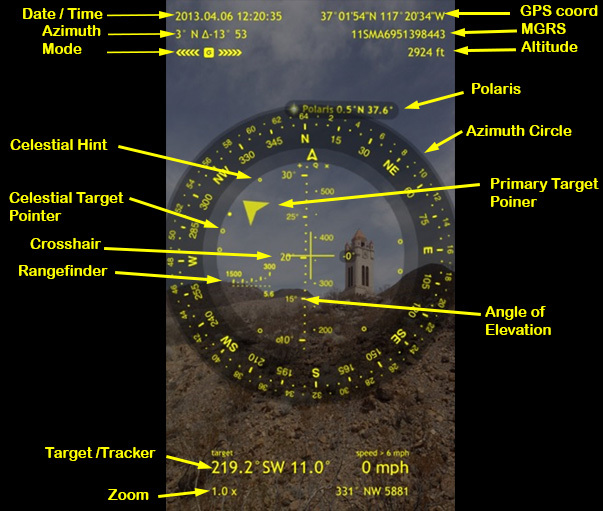 Spyglass overlays a navigation compass, star location and other information on the live camera view of the scene. All of the displayed data can be recorded right on the image as well as in the EXIF data of the photo. In the past we would use a complicated tripod leveling and degree app to show where Polaris would be. Not anymore. SpyGlass can show the position of Polaris during daylight well before it is time to set up for the pre-twilight shots. The students get a solid understanding what the photograph is going to look like before the night starts. Please note while we are fans of this app we are not paid to support it or promote it. This is not a comprehensive review. The user manual is 61 pages long for good reason! Spyglass is a well thought out app with a lot of functionality. The app is only as accurate as the sensors on your phone, meaning that if the GPS, Digital compass, gyroscope, accelerometer and camera are poorly calibrated your results can be very inaccurate. There is a lot that can contribute to errors or compound errors, and in some cases in some cases affects usability of the app. Really these issues are hardware related, but does affect accuracy and usability of the app. The superimposed photos taken with the app are “soft” focus in the detail around the text. However a screen shot of the same graphic is much crisper then a photo taken through the app. While not a show stopper the image could be a little crisper. You cannot see the path the object will take in the sky. This is troubling when trying to align objects like the moon to things on the foreground when the alignment is going to happen a few hours. Text color selections need to be carefully chosen to contrast with the background or they are difficult to see. The app only works on Apple products. The data is overlaid in real-time with adjustments depending on height, speed and incline, direction. Photos show the data overlaid on the foreground as well as GPS coordinates. This data is encoded in the EXIF data of the photo, too. 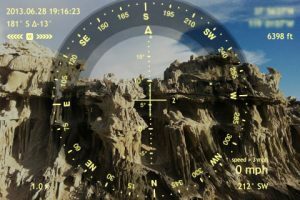 One of the most exciting features is the Sextant and Calculator which allow you to determine the height and angle of elevation of objects in the distance from the place you are standing. Very useful for celestial object (moon) alignments. Sharing your location and data is easy. Just tap and hold and you have a bunch of options to share where you are. Unfortunately you can’t share the photo and the location data in the same message. Multiple locations can be saved on the map so you can remember where those photogenic locations are and mark them for return to later. Multiple sky objects can be tracked. The Sun, Moon, and Stars (Polaris). 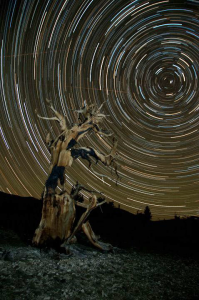 Knowing that Polaris is right behind a landmark helps you put a Star Circle where you want it. If you know where the Milky Way is the app can help you determine if it is possible to get the Milky Way arching over this pointy Tufa tower. Examples of some of the things you can do with Spyglass. Resulting alignment from the positional analysis using Spyglass. 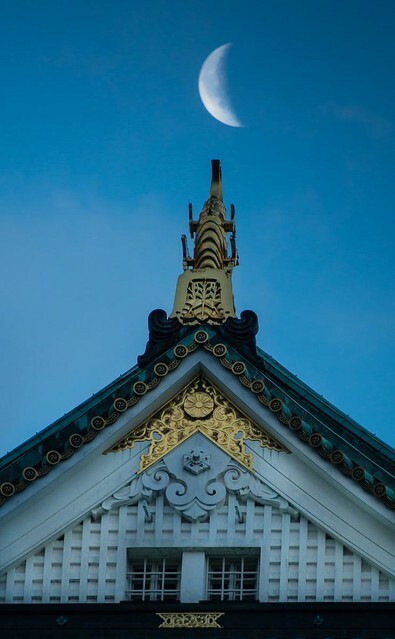 You can plan a Moon contact shot by measuring altitude and azimuth and then use those measurements as we describe in the “Catching the Moon” webinar to determine when the moon will be exactly where you want it to be. Looking toward the next day for the moon alignment. Checking the altitude and azimuth for helping determine the exact location to stand for the alignment of the moon over the Castle. 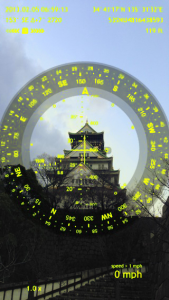 The resulting alignment from previous days scouting of Osaka Castle. Spyglass does have competition. There is another app called Photo Pills which we are also evaluating. Write ups soon! 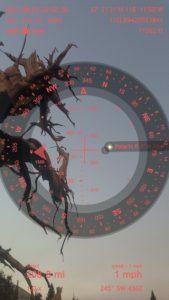 This entry was posted in Creativity, Gear, Photo Tip, Review, Tools and tagged application, augmented reality, heads up, iOS, shot planning, Spyglass on September 21, 2013 by Eric Harness.